Global smartphone shipments recorded 368.6 million units in the third quarter of 2018, declining by 3 percent annually, Counterpoint Research has said. South Korean giant Samsung still continues to lead the smartphone market with 19 percent market share in the quarter, even though smartphone shipments declined for the fourth consecutive quarter. Meanwhile, Chinese mobile makers continue to grow with strong performances in markets outside China, and together, Xiaomi, Vivo, and Oppo recorded their highest ever shipments in a single quarter. Apple iPhone shipments, however, remained flat annually, Counterpoint said. A new report by Counterpoint Research says that the top 10 mobile manufacturers now capture 79 percent of the global smartphone market leaving more than 600 brands to compete for the remaining 21 percent of the market. While smartphone shipments for Samsung declined in this quarter yet again, despite the company recording its highest smartphone shipments ever in India, Apple iPhone shipments also did not do well, the report said. However, for Apple, revenues for the devices grew 29 percent with a record average selling price of $793 (roughly Rs. 57,800). Meanwhile, Chinese brands continued their growth streak, as Xiaomi, Oppo, Vivo, and Huawei showed 25 percent, 4 percent, 7 percent, and 33 percent Y-o-Y growth respectively in the third quarter this year. They now hold 9 percent, 9 percent, 8 percent, and 13 percent of global smartphone shipments. 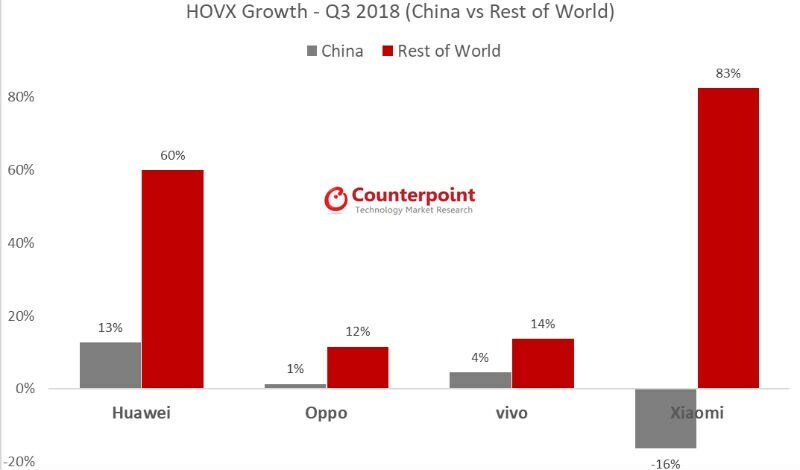 As for the claim that the Xiaomi, Oppo, and Vivo recorded their highest ever shipments in a quarter, Counterpoint’s figures show that Xiaomi shipped 35.7 million units, Oppo shipped 33.9 million units, and Vivo shipped 30.5 million units. 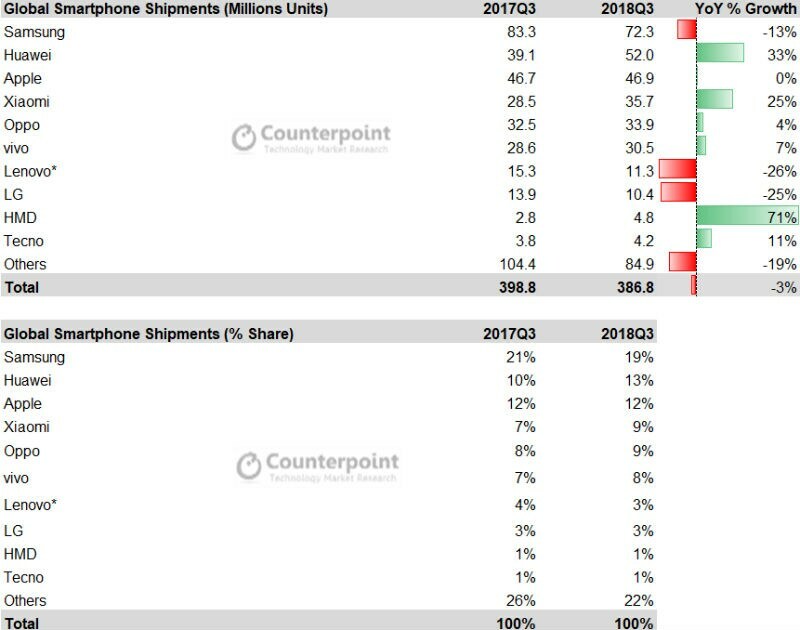 The top five smartphone makers in terms of shipments are Samsung (72.3 million units), Huawei (52 million units), Apple (46.9 million units), Xiaomi, and Oppo. Apple’s market share remained the same as the year-before quarter, at 12 percent. 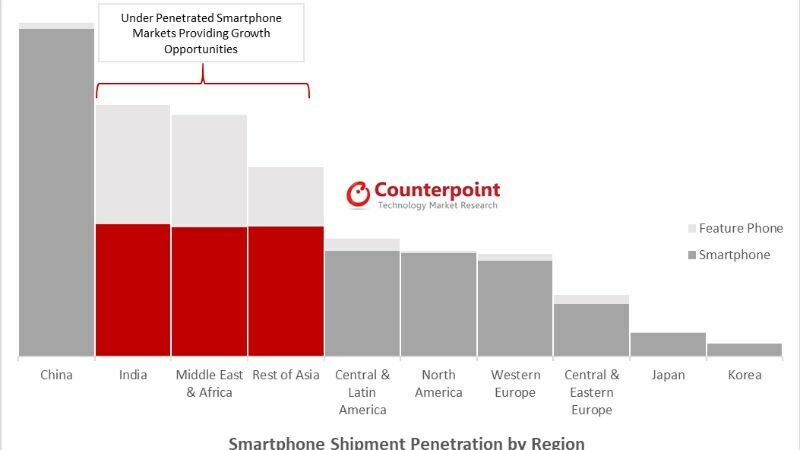 Coming to the other smartphone forecast report by Counterpoint Research, smartphone growth will drop to -1.3 percent in 2018. The report claims that this would be the first in the history of smartphones that the market has contracted year-over-year. 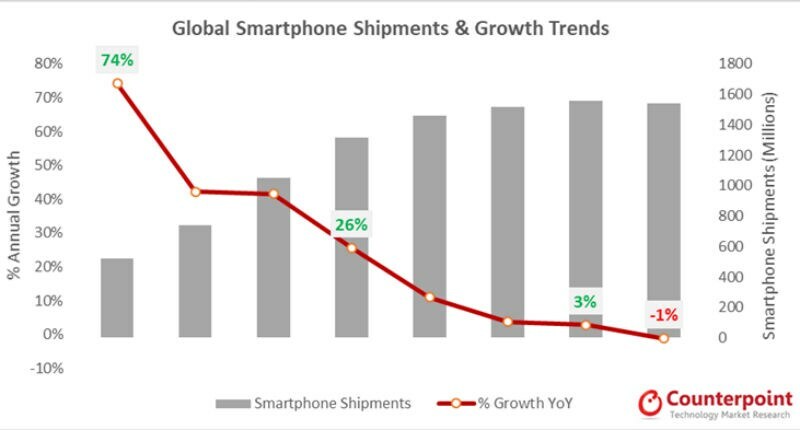 The global smartphone market has been witnessing negative growth since Q4 of last year. Before that, the report claims, the market had enjoyed a CAGR (compound annual growth rate) of 16 percent for the last five years between 2012 and 2017. The key reasons highlighted by Tom Kang from Counterpoint, include global economy slowdown, fluctuating exchange rates, US-China tariff wars, change in consumer behaviour, and more. Kang explained, “Many markets have already hit a saturation point for new smartphone demand and are dependent on replacement demand. However, since last year consumers have decided to trade up whenever they had the chance and are thus going for a better device, despite the price difference. This is evident in the introduction of Apple’s iPhone X last year. But buying a more expensive device results in extending the length of replacement cycles, especially when your earnings are limited.” The report added that overall smartphone revenue may grow 9 percent compared to 2017, which is even higher than the 7 percent revenue growth of last year. Copyright © 2019 Zgzcnet | All rights reserved.